It’s been a pretty whirlwind couple of weeks in the Mash House! Since we cooked our Croatian food and started thinking about Serbia, Miranda has gone back to work after the summer holidays, Ash has been home from work with a stomach virus, and to top it all, we got engaged on 29 August!! 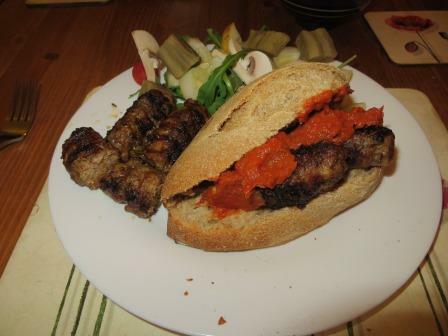 So, much as we had the best intentions to make cevapcici (Serbian sausages) with ajvar (roasted red pepper sauce) a week ago, we’ve had our minds full of other things. 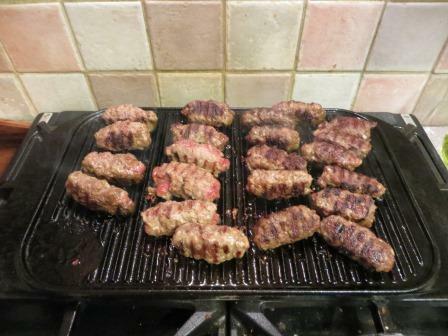 However, we finally got around to it last night, and enjoyed a summery Serbian feast. Until recently, we knew very little about Serbian food except that it is very similar to Croatian food, which is why we’ve revisited (and slightly adjusted) the recipe for Croatian flatbread to serve with this meal. With everything else going on, we haven’t spent quite as much time researching these recipes as we normally do, but we think we found some that were justifiably traditional. Unfortunately Ash can’t remember where he found the cevapcici recipe, so although they’re all very similar, apologies to whomever we’ve stolen this particular one from! Really easy! Mix all the ingredients together in a bowl. We then left it in the fridge overnight to let it fully combine but I’m sure you don’t need to do this. 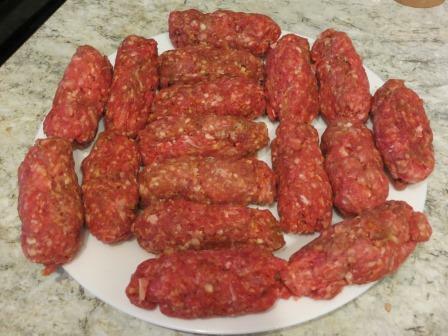 Form the mixture into finger-length, 3/4 inch thick sausages and cook on a griddle pan or BBQ. 1. Put the peppers under the grill on a high temperature until blackened all over. When cool enough to handle, remove the charred skin, core and seeds. 2. Meanwhile, do the same thing with the aubergine. When cool enough to handle, scoop out the flesh and discard the skin. 3. Put the peppers, aubergine and garlic in a food processor and pulse until roughly chopped. Add the oil, vinegar and 1/2 tsp salt and pulse until incorporated. 4. Transfer the sauce to a medium saucepan. Bring to a simmer over medium-high heat, then reduce heat to medium-low and simmer for 30 minutes, stirring regularly. Remove from heat and season. As mentioned above, we also served this with lepinja (or flatbread), sour cream and salad. We made one major adjustment to the lepinja recipe, which was to reduce the salt to a scant teaspoon instead of a tablespoon. We both agreed that this made all the difference and made the bread much more palatable! We enjoyed this meal, but both said that we wouldn’t go to any special effort to make the sausages again, as they weren’t really any different in flavour from a standard burger. 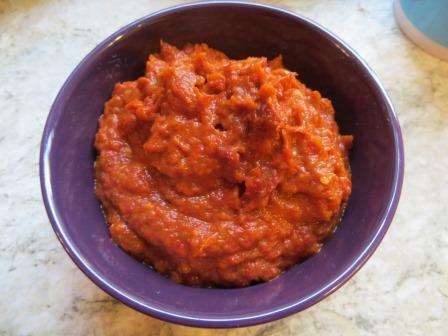 However, the red pepper sauce was really good as a condiment, and relatively easy, so it might make its way into the Mash repertoire. Our brains are mostly going ‘WEDDING WEDDING WEDDING’ at the moment, but fortunately there is some Romanian cuisine around the corner to make us think about something different for a few minutes (not that planning a wedding isn’t incredibly fun!). Having never been to Romania and having thus far done no research about its food, we have no idea what to expect, but we will share what we find out before too long! This entry was posted in Cooking, Dinner, Food, Meat and tagged ajvar, cevapcici, cooking, dinner, food, sausages, Serbia, Serbian food by mash29. Bookmark the permalink.